Automatic coffee machines are a life-savior for those who have not mastered the art of making high-quality coffee. There are many automatic coffee machines in the market, yet few are worth your money and valuable kitchen space. One of the best super automatic in the market is Jura Impressa C60. Do you want to get a hot delicious cup of coffee every morning without having to go through much trouble? Impressa C60 is the machine you want to get! Water tank capacity is 64 oz. The dimensions are solid, materials used are of high-quality, striking clean lines and perfect for small places. It is attractive to watch and it enhances the look of your kitchen with its sleek and tempting appearance. The smart rotary switch works on a one-switch operating system and a plain display of 11 languages is for the convenience of the user. A perfect cup of coffee is just one switch away if you have Impressa C60. Impressa C60 has its own conical bean grinder that ensures that beans are always ground perfectly to achieve delicious coffee taste every time. The grinder is the only major difference between it’s sibling Impressa C65 which comes with Aroma+ grinder that preserves the amazing and pure taste of beans at most. Even a novice can operate this machine without going through much trouble. It is not one of those automatic machines that come with a long manual that states “How to make it work”. One has to simply press the button and that’s pretty much it – hard to believe right? The controls are ultra-simple and quite easy to use. You can program how you want the brew to be, but many users like the way it works. You can easily adjust the strength of your coffee for each cycle. Your preference matters the most to the machine and it will operate exactly like you want it to work. Cup of any size can be used in Impressa C60; the spout can be adjusted between 2.6 to 4.4 inches. There is no risk of splashing of hot coffee and a perfect looking crema is achieved every time when the hot espresso pours down. 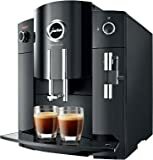 Jura Impressa C60 actually redefines the coffee brewing experience for you, and if you are looking for a super automatic espresso machine, then it is time to stop your quest. There are some minor issues such as the need of extensive cleaning, but this issue seems less important in front of its impressive coffee system and incredibly compact design. All in all, if you want a quality coffee without going through much trouble then Impressa C60 is the best option you have.